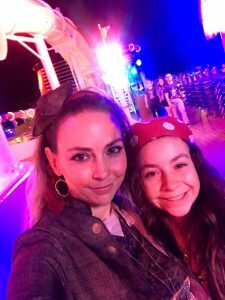 After going on a couple of cruises, including one on the Disney Dream and one on the Norwegian Bliss, I can honestly say that cruising is one of my favorite forms of travel. I very much appreciate the food and sunshine over anything else. The feeling of being surrounded by the beautiful ocean far from land on a large ship is rather enjoyable. Leaving the harbor is somewhat soothing, whether or not the harbor is dirty and littered with shipping containers. It excites me knowing that the journey has begun, and a journey aboard the Disney Dream is definitely something to be excited for. Cruising on the Disney Dream was a wonderful adventure that I’d relive again and again if I could. 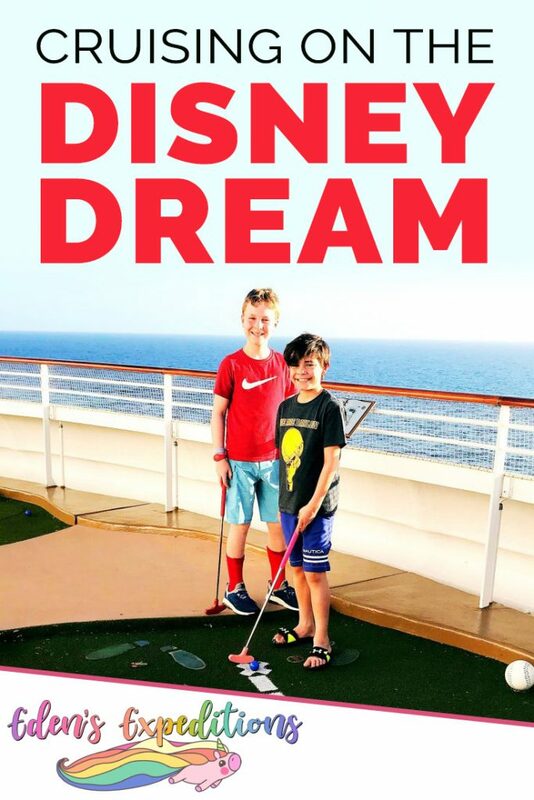 My family went on this three-night cruise in February after a trip to Disney World. My family and I packed up our bags, leaving them in the room to be picked up by luggage handlers. On that sunny Friday morning, we hopped on the bus that would take us to the harbor. We said goodbye to the beautiful Coronado Springs and sat back in our cushy bus seats. Upon arrival at the harbor, we quickly entered a building, shuffled through security, and floated up the escalator to the main floor. There were lots of other passengers there. Luckily, it wasn’t absolute mayhem. My family and I hopped in line to check in and figure out what time we would be having dinner each night. Everyone got a room key with their name on it and a lanyard. The room keys hold various pieces of information, such as room number, dinner table/reservation, and age. After receiving our boarding group number, we sat around and waited. My family was part of boarding group five, so we didn’t have to wait around nearly as long as some other passengers. Eventually, our boarding group number was called, and we filed into the line of people headed up the ramp to the ship. Staff members scanned our room keys on the way up the ramp. It was a very swift process, and we made it on deck in a matter of minutes. The moment we entered the ship, I was in awe. We were greeted by a grand room with a large golden chandelier, golden carpets, and golden walls. There was a lovely violinist playing, and the staff members called out the name of our party as we entered. At first, all I could think about was how they could possibly put so much stuff on a single boat. It must be Disney magic. 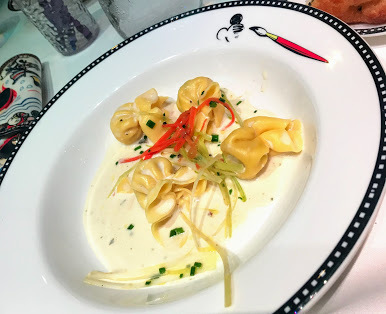 On all of the Disney Cruise ships, they have a special Rotational Dining system where your party transitions between each of the Main Dining restaurants. One day you’re eating dinner at the Enchanted Garden, the next you could be at Animator’s Palate or the Royal Palace. All of these are Main Dining restaurants on the Disney Dream, and all of them are delicious. Aside from these restaurants, there is also a small buffet near the pool deck, as well as several ice cream machines. My brother and I had to make the most of the ice cream machines during the day because they close around eleven at night. There’s also a candy shop that’s open pretty late, although I never did end up buying any candy. It was the appropriate time for lunch when we boarded, so we took the golden elevator down to level three. This is where we found the Enchanted Garden. We were quickly seated and handed menus. The Enchanted Garden must have been one of the most elegant restaurants on board the Disney Dream, although most of the ship was considerably luxurious. The Enchanted Garden is one of the main dining restaurants on the Disney Dream. This is where my family and I ate dinner our first night of the cruise. At lunch, I had a delicious roast chicken. We had a nice time eating our food within the Enchanted Garden as we tried connecting to the Disney Cruise app. Dinner at the Enchanted Garden was just as good, if not better. Bread, butter, appetizers, fantastic main courses and splendid desserts made for pleased taste buds and satisfied appetites. The Royal Palace is the most elegant restaurant of them all within the Disney Dream cruise ship. With golden carpets, drapes, and lighting, you truly do feel like royalty. Even my family felt special, and we were dressed up for pirate night. The food at the Royal Palace was just as wonderful as the food at the Enchanted Garden. In fact, most of the food at the main dining restaurants is excellent. Although the Royal Palace and Enchanted Garden are both elegant restaurants, they weren’t as cool as the Animator’s Palate. The whole restaurant is decorated with the theme of art and painting. There are screens on the walls where popular Disney character Crush swims by and talks to the different guests. All of the younger kids were fascinated by their conversations with the sea turtle. Once again, we were served with delicious food and desserts. While on board the Disney Dream, I ordered chocolate flavored desserts most of the time. Each of them was delicious, and I wish I would have taken more time to eat them rather than hurrying off to the teen club. Our cabin on board the Disney Dream was fairly nice. There was a queen size bed and a couch that pulled out into a bed. Housekeeping also pulls a bed down from the ceiling. There was room for the four of us that came on the trip; Mom, Jonah, Grammer (that’s what we call our grandma), and me. The room also had a small desk, as well as cabinets, and we even had a balcony. Grammer and I enjoyed the peaceful balcony while the ship was taking off from the harbor. There were a few outlets for our electronics, although it didn’t even matter if our phones were charged or not. The Disney Cruise line app hardly worked throughout the entire trip and our phones were practically useless. Of course, there was also a bathroom and shower. 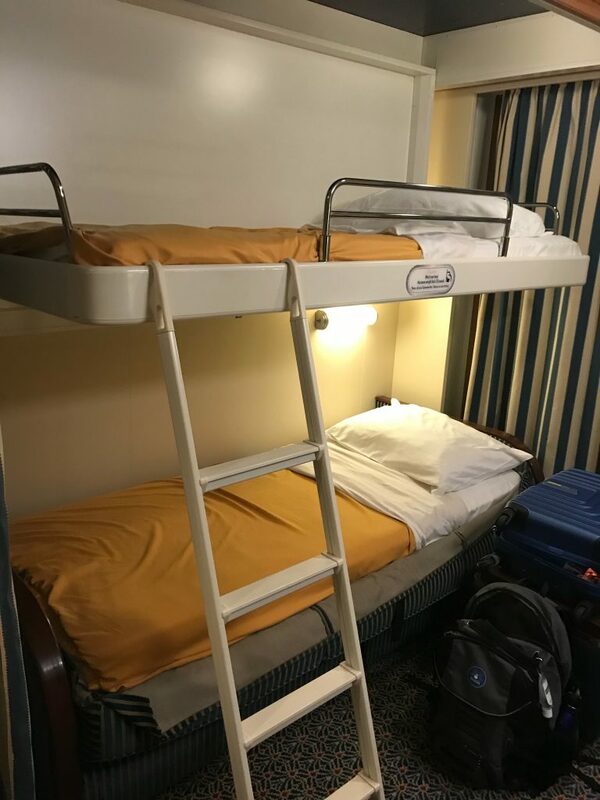 Although the bathroom, and the cabin in general, were pretty cramped, I don’t really expect much else from cruise ship hotel rooms. 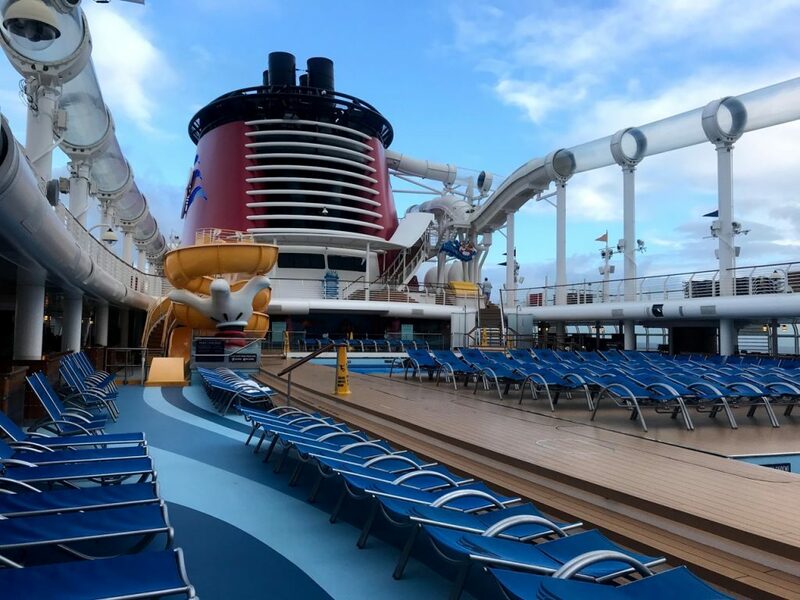 The pool deck on board the Disney Dream was rather small. There was a single pool that was packed at all times. Tons of little kids splashed around in the cramped space, enjoying themselves. My younger brother, Jonah, swam in the pool for a while, making in new friends. When there are that many kids in the pool, how can you not make a few friends? Aside from the main pool, there were a couple of small hot tubs. There’s also a section just for the adults, which was much nicer and much less cramped. Most of us kids were envious of the adults that got all of the space, but the teens didn’t have it too bad. Vibe, the teen club, has its very own pool deck. Of course, we can’t forget about the AquaDuck. The AquaDuck is the water slide that shoots across the top of the Disney Dream. It is also on the Disney Fantasy. Honestly, I never actually got the chance to ride the AquaDuck. There are just so many different things to do on the Disney Dream. I only ever went swimming once, and it was at the teen pool deck. My brother, on the other hand, was all over the place during our Disney Cruise. He did practically everything there was to do for kids his age. Jonah rode the AquaDuck multiple times. Clearly, the ride was very enjoyable. The Disney Dream cruise ship also has a sports deck near the very top of the ship. This is where kids and adults can play games like basketball, dodgeball, and mini golf. My friend and I played mini golf late at night while it was windy on deck. 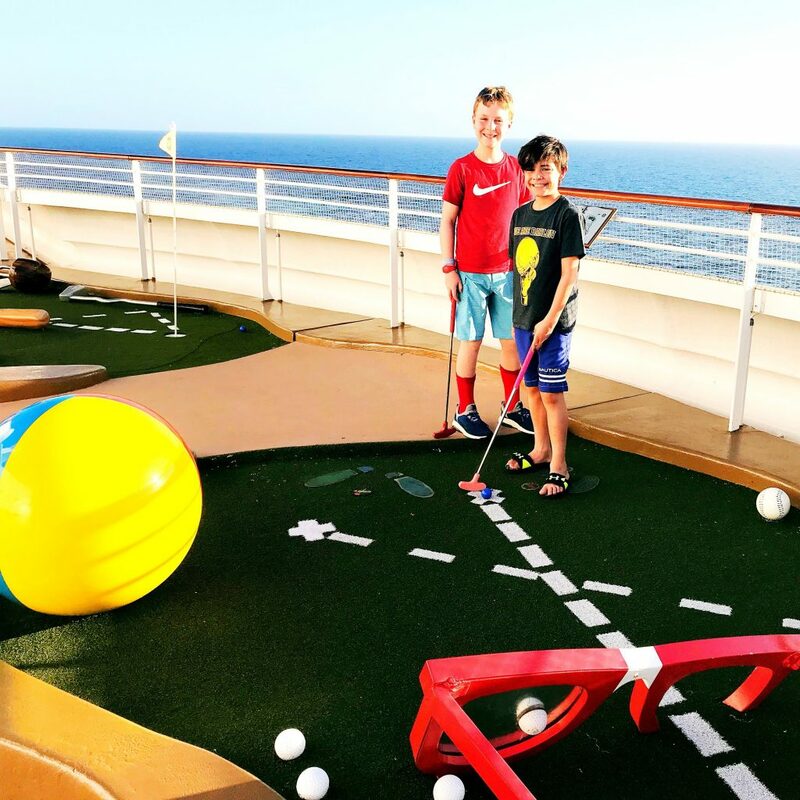 It was incredibly fun, although it was kind of hard to hear, and we were constantly worried about sending a golf ball flying into the ocean. The kid clubs organize sports games every once in a while. Everyone at the teen club played dodgeball the second night of the cruise at one in the morning. We had a good time, although there was one embarrassing incident. I was running, and all of a sudden I slipped on a part of the course that was slick with water. I imagine it looked exactly like the image they put on yellow “Caution! Slippery When Wet” signs. My feet flew out from under me, and I landed flat on my back. Aside from that, all was well, and my back was fine by morning. 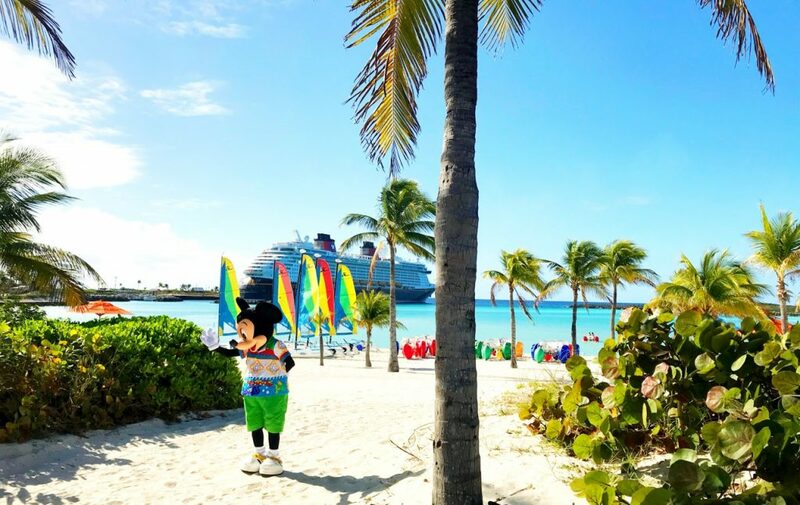 Disney’s staff members and family-friendly nature are one major element that sets Disney apart from any other cruise line or theme park. There is no doubt in my mind that the teen club on board the Disney Dream is one of the main reasons I loved this trip so much. I couldn’t be happier with the way that Disney employees, including kid club counselors, treat their guests. The kid clubs on board the Disney Dream give everyone a great opportunity to meet other passengers their age. Jonah and I made a few friends on board the ship. This aspect makes the journey that much more enjoyable for teens like myself. The Oceaneer Club is the club for kids between the ages of three and twelve years old. Larger than any of the other kid clubs on board, it had all sorts of unique decorations. Every kid within the vast area seemed content with the cool games and Disney themed rooms of the Oceaneer Club. I myself was impressed. I’ll also mention that I probably would have never found my way out if it weren’t for a helpful club counselor. Edge is the club just for tweens. My younger brother, Jonah, spent quite a bit of time here. 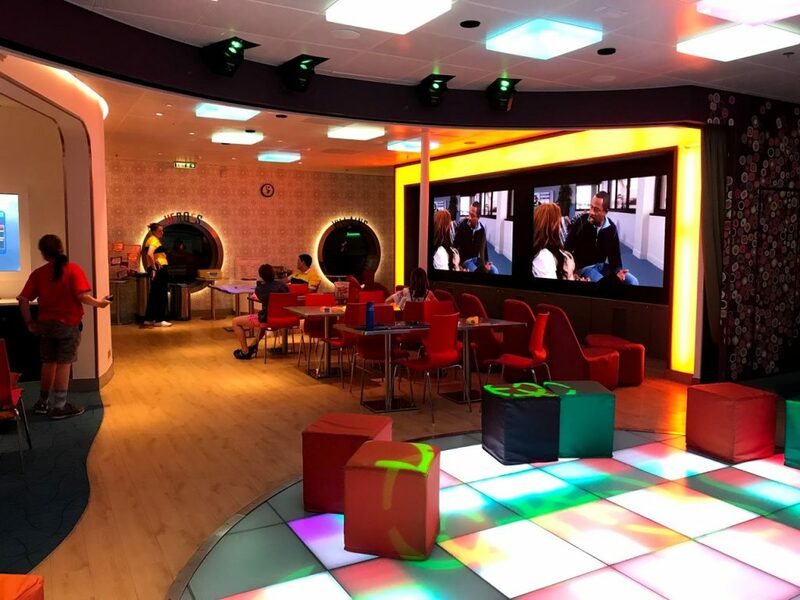 Although it is the smallest of the kid clubs on the Disney Dream, it is still cool and unique. Located at one of the highest points of the ship, level fourteen, it took me a short while to find Jonah whenever he ran off with friends. This is where I spent most of my time on the cruise. The teen club, Vibe, was the perfect place to make new friends my age, and generally, have a good time. You have to be between the ages of fourteen and seventeen, although a parent/guardian has the ability to get younger kids into the teen club. Just sign a waiver. In order to find the entrance to Vibe, you must go down to deck four. Go out the doors, and walk toward the front of the ship. At some point, you will walk into the front of the ship, a vast white tunnel filled with life vests and workers. It often feels like you are trespassing in a place you shouldn’t be, but there are signs pointing to Vibe. Just keep walking, and you’ll eventually find a staircase. Just up those stairs is the main entrance. I explain this because it took me forever to find the club the first time around. This is the path I would have to go down in the dark of night when leaving dinner early or finding my way back to the room at two in the morning. Sometimes I would be accompanied by other teenagers, but it was a strange journey either way. Vibe has plenty of games for all. There are multiple small gaming pods built into the wall, and there’s a whole other room beyond the main space with a VR set, foosball, and other gaming consoles. I myself won a few rounds of Super Smash Bros as the character Kirby. Late night games were most of the fun. There were also competitions and group games each night. I enjoyed most of them, although I’m not the best at charades. There are some things that I simply cannot force myself to do, like pretend to fly around on a magic carpet. As I mentioned earlier, Vibe has its very own pool deck. The pool deck has three interconnected pools, although there is no hot tub. It’s not really made for swimming, just relaxation, and conversation. The counselors gave each of us a pair of sunglasses that said Vibe on the side. Unfortunately, I lost those near the end of summer. There were also plenty of chairs to lay out on, as well as ping pong, and a splash pad. Each of these was a great addition to the pool deck. All of the teens were happy to have this area all to themselves. My brother was slightly jealous, so consoled him by informing him that we can’t use the pool deck at night. The Disney Dream has two different theaters. One is for movies, and one is for plays. There are a couple of different movies playing each day, and I attended a showing of The Last Jedi with some friends from the teen club. It was a very nice movie theater, with comfortable seats and a good speaker system. In the second theater, there are musicals each night. There are often two showings of whatever musical they are performing that day, so you are likely to have plenty of time to see each musical. I attended all of the musicals, including The Golden Mickeys, Beauty and the Beast, and Disney’s Believe. The musicals were fantastic, although I couldn’t get over the cheesiness of Disney’s Believe. 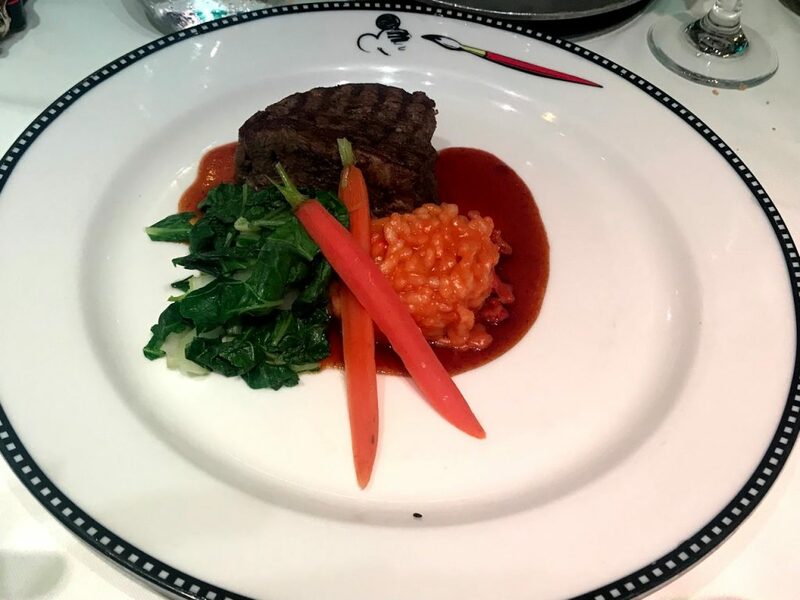 There are a couple of different parties and themed nights that passengers can take part in while on board the Disney Dream. My mother got really into the spirit of pirate night. She was in full costume. I, on the other hand, just put on a pirate goofy bandana and called it good. There is also a special party for when the ship initially sets sail. Of course, I can’t forget about Disney’s very own Private Island, Castaway Cay. Our day on the island was one of my favorite parts of the trip. 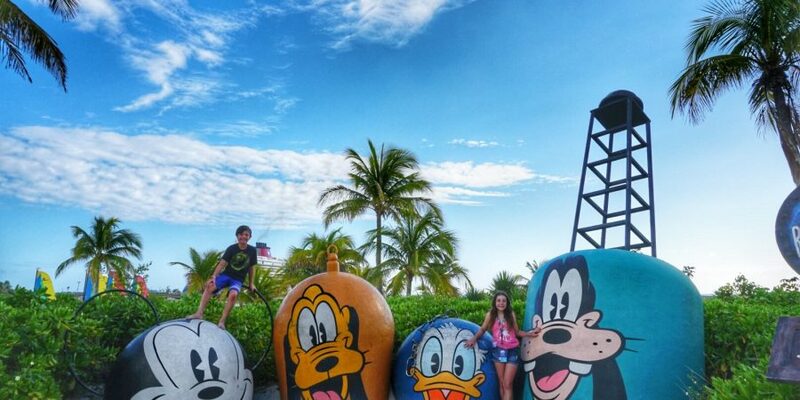 We hopped off the Disney Dream in the morning with all of our beach day supplies and grabbed a ride to the main tourist area. The island was hot, the water was soothing, and everything was perfect. Although there are plenty of things to do at Castaway Cay, snorkeling, sailboats, etc., I spent most of my day wading around in the water and laying out on a beach chair. A small structure with monkey bars sat out in the water, but I only ever tried it once. When I go to the beach, I mainly go to sit in the sun. Castaway Cay also has its own area for the teens, although it is small and slightly hard to find. There’s not much to do at this private hangout, so I’d advise you to spend your time elsewhere. Other than that, I have no complaints about the sunny island of Castaway Cay. Disney’s Castaway Cay has plenty of places to eat, so you don’t need to worry about that. Just follow the mess of signs. Eat a quick, tasty lunch at any number of places, and get back to your day of fun in the sun. There are simply so many great things about cruising on the Disney Dream, I can hardly remember them all. Every passenger I saw was as happy as a clam. Nobody looked forward to the time we would have to get off the ship, but the luxuries of the cruise kept us distracted from such thoughts. 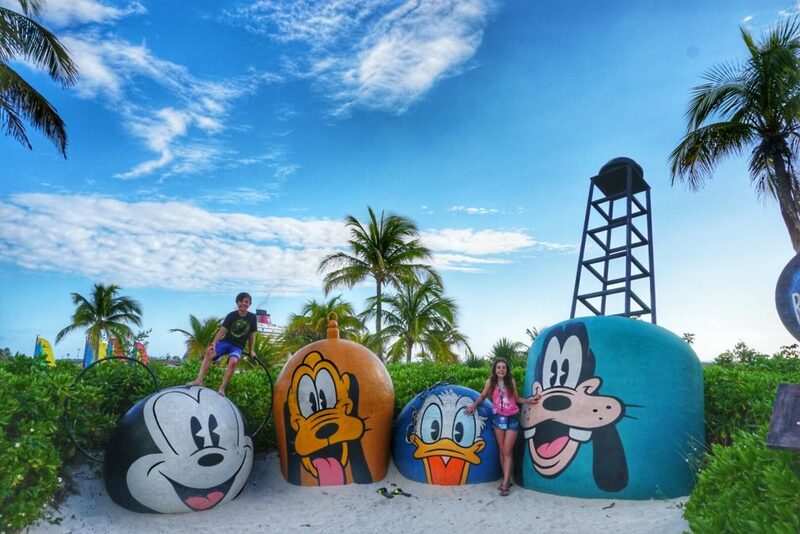 My family and I had a wonderful time aboard the Disney Dream and at Castaway Cay. It was my first cruise ever, as well as my brother’s. 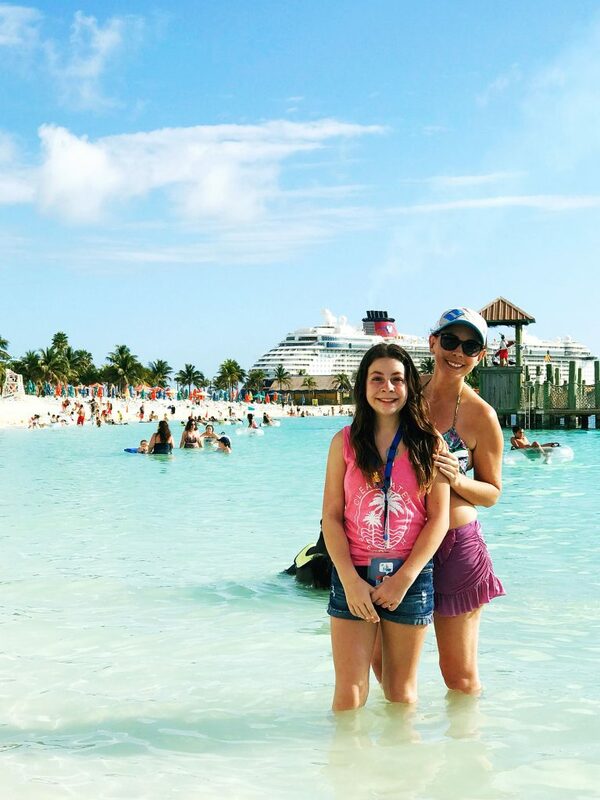 I can’t wait for the day I can return to the sunny beaches of Castaway Cay, and the teen club aboard the Disney Dream. This is definitely one of the best trips I’ve ever taken, and I’d advise everyone and their family to give Disney Cruiseline a try. Even if you’re an adult and you don’t have any kids, Disney cruises are highly enjoyable. If not a Disney cruise, give the Norwegian Bliss a go. Either way, you’re bound to have a fantastic vacation.